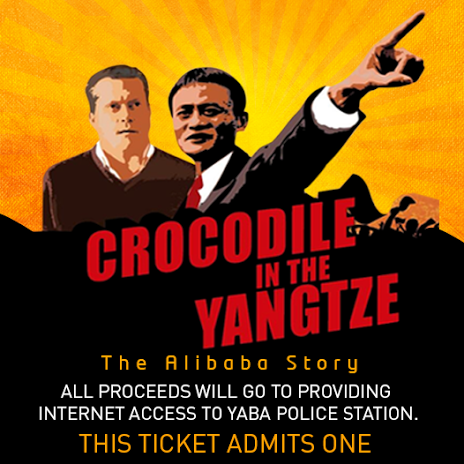 In a social Obligation rather responsibility drive to give internet access to the Yaba Police station & to power Nigerian entrepreneurs, Nigeria’s largest online mall, Konga.com will be bringing the movie/documentary “Crocodile in the Yangtze" (The Alibaba Story) to Nigeria on Tuesday Jan 14th 2014 at the Ozone cinemas, Yaba. This award-winning independent documentary follows China’s first Internet entrepreneur and former English teacher Jack Ma, as he grows Alibaba from a small apartment business into China’s first global Internet company, while battling and beating eBay in China along the way. The movie, “Crocodile in the Yangtze” has been screened in 11 locations around the world, and chronicles the work experience of the Movie Producer and Director, Porter Erisman with Alibaba.com, where he worked for eight years and for the first time, will make the documentary available for screening in Nigeria and Africa, which is home to many internet Startups. Crocodile in the Yangtze concludes the emotional ups and downs of life in a Chinese Internet startup company at a time when the Internet brought China face-to-face with the West. There will be an introduction of movie by the CEO of Konga.com, Sim Shagaya, followed by a Q&A session with Porter Erisman, Producer & Director of the documentary. A post- movie roundup by Jason Njoku, CEO of iROKO Partners Limited will follow thereafter. Tickets are available on sale for N500 on Konga.com (Limited tickets available) with all ticket proceeds donated to the Yaba Police Station for Internet access provision. There will also be 5 free tickets given out to students from the departments of Computer Science, Engineering Department in the University of Lagos, and the Co-Creation Hub, Lagos (CChub).